Blue Beetle III is the standout figure of the wave. I've always been fond of DC Direct's version of Jaime Reyes, and was wondering if Mattel could top that with their version. This one well and truly bests the previous figure through the use of extra articulation new to the DCUC line which makes the Beetle extremely poseable. This is backed up by very solid sculpting and paintwork, and topped off with a fantastic set of wings. I couldn't get the DCD version off the shelf fast enough to put this beauty in pride of place! I hate to rank Negative Man second, as he's definitely the "Oh wow!" character of the wave for me, but BB's detailing and articulation win out. I think this is one character that could make use of a slightly thinner, less buff buck without going to the Shrimpestro extreme, but this is still very fun and well executed, and I'm delighted to have the figure to fill out the Doom Patrol ranks. I passed on the exposed skeletal face variant of Larry, disappointed that we didn't get a Negative Form variant which would have been a highlight of the whole line for me. Someday, perhaps! I'd rank Blue Devil as my next favourite figure of the wave. While I'm disappointed overall with DCD's History of the DCU line, the over-bulkiness suits Blue Devil, but the headsculpt really let the figure down. While this one needs a slightly bigger bulk, the headsculpt makes it a winner in my book. Cyclotron, despite my lack of interest in the character, is well done in terms of execution and presentation of the character. He also has the groovy removable face a la the original Super Powers figure. This version of Superboy is another figure I'm not overly fussed about owning, but I am pleased to see that he's not been done with the way too small "teen buck" that has been one of the lowlights of the line so far. We really need a boxed set of characters like Kid Flash and Beast Boy redone in this buck to make up for their teeny-weeny first appearances in the line. Nice points for Superboy: his jacket is well sculpted and his glasses are removable. Let's hope for a similarly scaled Impulse and Robin for the Young Justice fans! The ladies of the wave automatically fall to the bottom of the rankings because of the limitations of the female DCUC buck, which I won't repeat my frustrations over again. The Golden Age Cheetah comes off the best of the bunch, although I think she needed a lighter yellow to really recapture her look in both the comics and the Superfriends cartoon to which we doubtless owe her presence in the line. It's the same tone as the "skin" of the modern Cheetah, that is what can be seen under her modern costume which was been painted on. I have managed to pick up the "animal skin" version (not pictured) and I really don't get the reason behind the last minute change to add the black outfit, as all that the plain black does is accentuate the faults of the bulk in the legs. The bottom dweller of the wave, very sadly, is poor old Donna Troy. The only thing more mixed up than Donna's origin is this figure. The wonky paint application on the eyes is just a killer. Add to that the lack of any sculpting for the halter top, the especially chunky thighs and the slightly different shades of red on the legs, and you have a figure that Mattel should have killed that got murdered instead. Big shame. 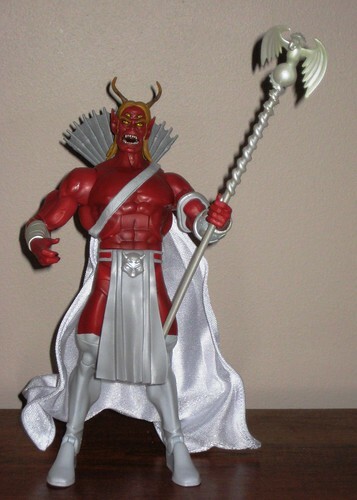 And finally, to the piece (or pieces) that greatly lift the overall standard of the wave: the Trigon Collect and Connect figure. This big red guy is all kinds of wow. It's great to see a totally different buck in use, and the use of some really intricate pieces like his collar and loincloth. The inclusion of a cloth cape and his staff are also big wins, and this has to be up there as one of the best CnCs in the line to date. The only thing I'd improve is to make his horns a bit bigger, but that's by the by. He's awesome. Poor old Donna don't get no respect. The wave wasn't one of my favourites but if they keep up the variety then it's a win. Great review Andy! well i used to buy only one or two figures from a wave/series, those that i like the most, cuz i consider too risky (& still think this way) to buy a whole wave/series... but sometimes i make exceptions... in this wave i would go for Blue Beetle & Superboy... anyway, which DCD Blue Beetle u mentioned ??? the Kingdom Come series ??? What?! someone liking the cloth cape? Blasphemy. Negative man is cool to me, but I can't shake how he's just the same dude with new hands and head. Because he is. Blue Beetle has articulation this line should have always had. And the accessory count too. Someday they will make a decent female fig (other than Giganta). I'm with Chopa. You could repaint Trigon with pale colours and you've basically got David Bowie lookin' atcha. I really like the Superboy but I can see the limitations of comic book lines like this as mass market toys. I can't point to any one of these figures and say, "I know who that character is." Sure I know Donna Troy and Cheetah are from Wonder Woman but that's all I got. It's little wonder that Mattel and DC can't really mass distribute some of these. Despite being decent figures, there's not much name recall for anyone but fans of the comics. That said, I still really want the female figures from this line, if only to duke it out with Wonder Woman. seeing Trigon put together makes me want to get the whole line. even though i do not care for cyclotron as for donna troy she has never has managed to get any respect the female version of Rodney Dangerfield. The presence of Cyclotron and Golden Pharoah, who were created exclusively for a toy line 25 years ago, is conclusive proof that this line is marketed to the Centrum Silver crowd, like me, and not to our kids. Of course, to make the Super Powers line complete, they have to do Robin in his original (fishscale briefs and pixie boots) costume. Wonder if they will? 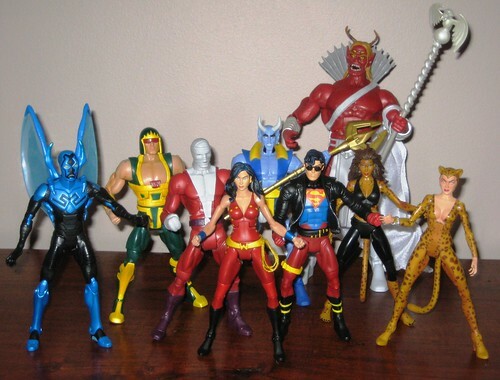 Trigon is indeed awesome, but I also thought Jaime was the top figure in the wave. I love the DCD version, but Matty schools them with their outstanding work.